Gizmo, Strawberries are among my favorite things to grow, & I've raised them in my garden (& in containers) for more years than I care to count, so I'm happy to share what I know with you! Let me see now... I only have a few tips that apply for this time of year. The rest can probably wait for spring, when your plants wake up & start getting busy. I put a lot of sand in the soil where I plant them. (A garden guy on TV says that it makes for sweeter fruit, but I don't know if that's necessarily accurate.) Sand does allow for good drainage though, as strawberries don't like to have their feet wet all the time, & I think it also makes it easier for the roots to spread out, & for the runners to set their roots down early. NEVER bury the crown of a new plant, or it will smother! If the new plants you have are from runners & don't have roots yet, just push them down into the soil a little bit & keep them moist (but not real wet), so they can send roots down on their own. Plants already having established roots should be planted with the top of the crown above the soil line. Plant strawberries where they'll get full sun all day long, if possible. If you're still getting a lot of sun & warm weather during the day right now, you might want to shade them for several days after planting. Strawberry beds should be covered over with at least 2" of dried leaves or straw during the Winter months. Strawberries are very hardy, but still need to be protected if you're in an area where the ground freezes in the winter. By the way, welcome to the forum! There are so many friendly people here, all willing to help each other & share gardening experiences (as well as hobbies, pets, kids, recipies... the list goes on). Our forums are also monitored 24/7, keeping this probably the safest & most comfortable place on the Web. Please stop into the New Member forum & introduce yourself... or just jump in on a topic & join our "family"! Hope to see you again soon... & often! I have a strawberry question. I got a small strawberry plant from my local nursery several months ago and planted it in a container for a friend, the above plant has done beautifully rapidly filling its pot and sending out several daughter plants which I have since gotten to root in other pots as she had to move and left the plant with me to care for. My question is this, is it common for strawberry plants to have varigated leaves? What I mean is some are a rich deep green and others only the veins are deep green, the surrounding leaf tissue is a paler green. they dont appear to have been attacked by anything and I dont use chemicals in my gardens so there shouldnt be anything to burn or discolor them. Any ideas would be great. Gosh, Snowwolf, that's a new one on me! There are many varieties of strawberries, but I'm only familiar with a few of them, & haven't seen or heard of a type with variegated leaves! I know that temperatures & sun exposure can change the leaf color, but what you describe sounds characteristic of a particular variety. It sounds lovely! You say that it came from a nursery... I'd be interested to know what type it is, & I'll just bet they can tell you the name of it. When you find out, be sure to come back & tell us ...& see if you can bring a picture of it! Its an every bearing I think, a sequoia from what the tag says but no one can explain why the leaves are like this. Its pretty though and I was just wondering if it was normal or if I should be concerned. I don't know why your Sequoias have such interesting leaves, but if they're as happy as you describe, I don't think there should be any cause for concern. They DO sound pretty... As showy as strawberry plants can be, I'd just love to have your Sequoias in my Strawbery Towers!! I'd love to see yours! Got pictures? What lovely plants. No I dont have any pics yet but I do have a camera and could likely take a few shots of the garden. That is if someone can walk me thru how to post once i have them. Sounds like they need iron chelate. That's what my lemon tree's leaves looked like until I began dosing with the iron chelate. yellow leaves so that the plant won't waste its energy trying to hang onto itself, so to speak. I'd try the Miracle Gro-can't hurt. Since you're in Florida, I don't see a problem, it's not like your plants are going to go dormant, as mine don't. I often have strawberries in February. The plants seem to just do their own thing here. I often remove spent leaves,flowers and fruits from my plants so they dont waste energy keeping them going. If and when they turn yellow I will but as of yet they havent changed. Just a lighter shade of green with dark green veins. Will try the miracle grow tomorrow . 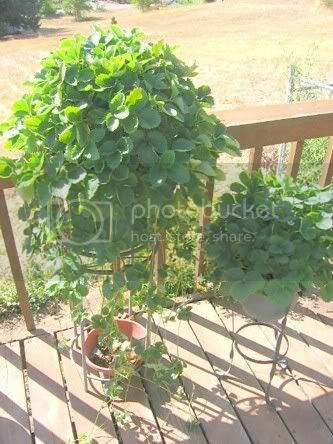 Maybe with all the recent rain I should move it onto the porch, trouble with that is it wont get the full sun it needs if i do. Any suggestions? I know it drains well but im not sure its draining well enough. Snow, good drainage is crucial. Is it possible that the lighter green leaves are just new leaves? The plants would do OK with just 6 hours of sun each day. Mine are on my patio in large tubs, getting about 6 hours' sun, and happy as clams. Er, strawberries. I know some of them are new leaves but the others are adult. I added some iron and some miracle grow to the usual routine and while there are still a fair number with that varigation it seems to be improving. As for the sun issue most of my porch is shaded due to morning glory vines and an assortment of bushes so the strawberry is in a sunny patch right as you come outside my front door. It generally gets a gentle pat or stroke as I pass by going in or out. Will keep you updated on its progress. Well it died, found out why too. Keep at it and don't give up tryin' SNOWWOLF..
She has in the past caused a considerable amount of damage to my plants. She is under the mistaken impression that anything on the property belongs to her regardless of where it came from. Up to and including the personal items in the apartment and any plants or animals kept outside. A few years ago she butchered a pair of hibiscus I have along my walk,chopped some 2 dozen 3 foot long spikes from both,I was seriously t'd off and called her repeatedly asking where she got the idea she had the right and if I EVER found her messing with my things I would call the cops on her for destruction of private property. She's got a screw loose or somethin'!!! I would call some kind of health types on her. She cannot just poison your environment like that !!!!!!! Get a doctor's note or something, if possible. Renters have rights too !!!!! Do you have renters' complaint offices there? I still have some small daughter plants from the one she killed so yeah I will try again. Might even put some in a childs wading pool like I did my cantaloupes this year. As for ways to get back at her yes I have a few but with limited funds and the lease being in my roomies name only I dont have much legal power. Snow, OK to put you on my prayer list? This person has no right to poison you or anybody else !!!! Prayer never hurt! So feel free. I clipped off the dead growth yesterday and am gonna see if it maybe makes a come back, with plants who knows. If not i will simply dump the pot of soil,add a bit of organic matter and replant the daughters i transplanted to different spots in my yard. Being in Florida helps since we usually have good weather for most of the year so who knows they may do ok and in spring be ready to have berries. I was sickened & enraged to read what your landlady has done to your plants! Although landlords have a right to inspect their rentals, & an obligation to make repairs or do whatever is necessary to maintain the property (killing weeds could be considered maintenance), they only have "Right of Entry" for emergencies (or if your rent hasn't been paid for more than half of a rent payment period). Otherwise, they are required, under a state statute, to give reasonable notice (12 hours in Florida) before entering any space that is considered your domain. Landlords are also liable for any damage that may occur during their repairs or maintenance work... & that includes killing a tenant's plants, whether it be deliberate OR through negligence! All states have landlord-tenant laws, which are regulated by the U.S. Department of Housing and Urban Development (on state levels), & overseen by each states Department of Consumer Affairs, through their Attorney General offices. You can request a copy of those laws for your state, & obtain complaint forms, by calling your Consumer Protection hotline at 1-800-HELP-FLA (435-7352). I encourage you to do so! It's a shame that we even need laws to force people to be civil to one-another, but it sounds to me as though your landlady is exactly the type of person who has made such laws necessary! If you take action against her, she may be fined, ordered to replace or reimburse you for the plants she's destroyed, (or in some states, even ordered to waive your rent for a couple months!) ... but she CAN NOT evict you! She could make your life miserable (in sneaky ways that you can't prove) in order to get you to move out, but it doesn't sound like you have a good rapport with her, anyway. Way to go, Patty !!!!! You go, girl !!! Financial issues prevent me from getting a new place,so at present Im stuck with my roomie who has been a friend for many years. At the momen his is the only income. As for the lease there is nothing in it dictating that I cant have a garden or add plants within the area of my apartment. (its a double duplex one facing the other in a small quad) and I have planted many plants around the property simply as a means to make the place less a desolate wasteland. I enjoy the sight of green growing things around me as well as the micro environments they provide for insect and animal life. However when I do leave(insert when he** freezes over or I win the lottery lol) ,my green children will be going with me. Since the incident with my hibiscus plants she hadent messed with anything untill the strawberry so I had assumed the situation was under control, guess not. Thanks for the info and concern though good to know Im not alone in being angry for her stupidity and wanton distruction. You're definitely NOT alone - and keep us posted - we're all on your side as you can see ! Love your term "green children " ! *sighs* Found out today an old neighbors ex-boyfriend may also have been partially to blame for the death of the strawberry plant. She believes he may have relieved himself in the plant as a means to get back at her thru me. Ah well again I will simply continue on and hope for the best. He also stole one of my ripening cantaloupes sometime during the night,one I had intended to give to a friend which necessitated my giving him the other ripe one I had intended to have myself for a late snack. Wouldnt be so angry about it is he had simply asked but he chose to steal it instead.